↑ 3.0 3.1 3.2 Dewey, T. and S. Bhagat. 2002. "Canis lupus familiaris Archived 23 October 2014 at the Wayback Machine. ", Animal Diversity Web. Retrieved 6 January 2009. ↑ Wayne, Robert K. (1993). "Molecular evolution of the dog family". Trends in Genetics. 9 (6): 218–224. doi:10.1016/0168-9525 (93) 90122-X Check |doi= value (help). PMID 8337763. ↑ Skoglund, P. (2015). "Ancient wolf genome reveals an early divergence of domestic dog ancestors and admixture into high-latitude breeds". Current Biology. 25 (11): 1515–9. doi:10.1016/j.cub.2015.04.019. PMID 26004765. ↑ Axelsson, E.; Ratnakumar, A.; Arendt, M. L.; Maqbool, K.; Webster, M. T.; Perloski, M.; Liberg, O.; Arnemo, J. M.; Hedhammar, Å.; Lindblad-Toh, K. (2013). "The genomic signature of dog domestication reveals adaptation to a starch-rich diet". Nature. 495 (7441): 360–364. Bibcode:2013Natur.495..360A. doi:10.1038/nature11837. PMID 23354050. ↑ "World's Largest Dog". สืบค้นเมื่อ 7 January 2008. ↑ "Guinness World Records – Tallest Dog Living". Guinness World Records. 31 August 2004. Archived from the original on 11 July 2011. สืบค้นเมื่อ 7 January 2009. ↑ "The Case for Tail Docking". 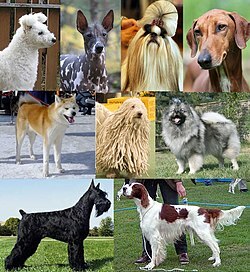 Council of Docked Breeds. สืบค้นเมื่อ 22 October 2008. ↑ "Bourbonnais pointer or 'short tail pointer'". Braquedubourbonnais.info. สืบค้นเมื่อ 19 December 2012. ↑ "Plants poisonous to dogs – Sunset". Sunset. หน้านี้แก้ไขล่าสุดเมื่อวันที่ 26 ธันวาคม 2561 เวลา 17:02 น.